Shearing Day will be here in just a few days. With all this rain it feels more like April Showers instead of May. I sure am hoping for a nice sunny day. It will be so much nicer to store dry fleece instead of wet. Why do we shear the alpacas? Shearing is important to the health of the alpaca. While their fiber keeps them warm through the winter it is too heavy and hot through the summer. 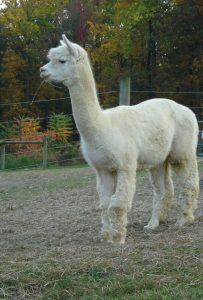 The alpacas do not shed the extra fiber so it must be shorn off to keep the alpacas comfortable and healthy. The alpaca fleece is valuable. It’s a great reason to shear them. 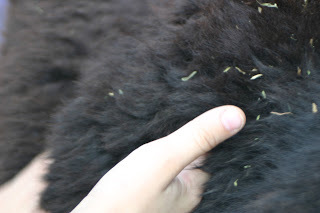 Even if you have pet alpacas shearing is a must because of the health issue. At Quarry Critters Alpaca Ranch we have many volunteers to make this transition move smoothly for all 38 of our alpacas and 4 alpacas that will be returning to get their hair cut. We have handlers that go into the fields or stalls to collect the alpacas by halter and lead. 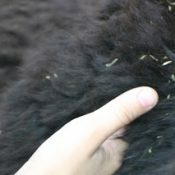 The handlers bring the alpacas to the groomer that uses special tools and a vacuum to get the large and small unwanted vegetable matter, dune and dust off the alpacas. The handlers also talk sweetly to the stressed out alpacas, soothingly waiting until it’s their turn on the mat. All four of the alpacas legs are restrained and the alpaca is gently placed on an athletic mat. Our shearer, Nathan Good, then proceeds to get the alpaca a haircut. Nathan brings his own helper to hold the alpaca’s head. If needed the alpaca will get their teeth and toenails trimmed. Once release, after about 10 minutes, the handler will return the alpaca to the field. Then the fiber fun begins. During shearing day we sort through the 2nds & 3rd cuts to fit the artisans needs instead of where it comes off the alpaca. The artisitians would like to use 2nds that are as long as your thumb or longer and 3rds then are shorter than the length of your thumb. 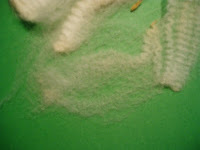 Purchase the whole fleece($2.00 per oz) and receive seconds & thirds at no additional charge. Spent $65 in the gift shop (this includes the fleece) and receive a free needle felting kit. 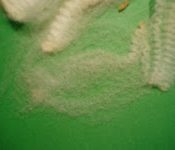 Fleeces can be seen on the alpacas on Saturday, May 19, 2018 by appointment and picked up on Sunday, May 20th after it is shorn off the alpaca. Now that’s a fresh fleece. Look forward to seeing all sometime out at the ranch. Oh that darn Meningeal Worm…. As an alpaca owner we are always worried about that darn little worm that can migrate into the alpaca and cause damage to the central nervous system or result in death. That worm is know as the meningeal worm and is hosted by the white tail deer. In PA, we certainly have lots of white tail deer running about about therefore protocol calls for deworming of our alpacas. Here at Quarry Critters Alpaca Ranch we use Dectomax every 6 weeks and we have Guinnea Hens. Guinnea Hens are a pea fowl that eats this snail and their eggs/larva. Another dewormer often used alternatively is Ivermectin. * Ideally alpacas should not graze in the same pasture as the white tailed deer. woven wire not high tensile fencing. Make every effort to know the prevention and be diligent in your management to reduce risk and maintain a healthy meningeal worm free herd. would be able to put pressure on his legs. This was incredibly helpful. He fought a good fight. He stayed true to the end. May 12, 2014 at age 10 Ace passed away. Ace is survived by many fine off springs both male and female. He was able to produce many colors but his favorite color was medium fawn. His EPD put him in the top 1% of the American herd for his fine crimp. Ace participated in alpaca shows such as 2005 Empire Show and placed 5th out of 12 white yearling males, 2006 was in the North American alpaca Show and placed 6th. He was also known for his incredibly dense blanket. Ace was loved by all and will be missed. When I first started looking into alpacas I kept hearing this word micron. What the heck is a micron? After listening, asking questions and reading research I think I have it figured out. Pretty important word to know as an alpaca breeder. 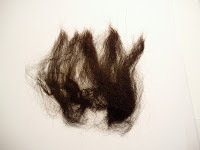 So here is what I found. . . .
Micron count is a way of evaluating each hair or fiber on the alpaca. So in many ways a micron is a tool. It’s a way to figure out the value of your alpaca’s fleece. Like this . . . . . I shear my alpacas, send the side sample off to Yocom-McColl which is a lab that use microscopes, scanners and computers to evaluate that sample and then tells me the results. Based on the micron count, that they tell me, I then know the best use of the fiber. Like this. . . . . . . 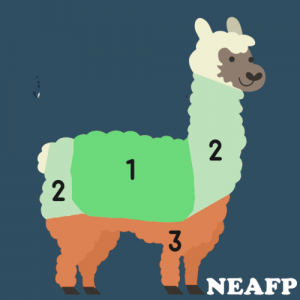 I have an alpaca that has a micro count of less than 20 up to 22 microns then I’ll want to make something that is next to the skin and will be gently used maybe a shawl or baby items. Micron counts that are 23 – 28 are the most versatile and can be used for lots of items that are worn very comfortable next to your skin. Because alpaca is so soft, alpaca breeders want everyone to feel this comfortable fiber. Then there is the higher number of micron count such as 29 – 32 this might start to feel a little less comfortable. There is still a use for this warm and cozy alpaca fiber and that would be to use it in batts, felt or outerwear. A micron is a tool that alpaca breeders use, to determine what product to make from the raw alpaca fiber that comes off their alpacas. A micron is a tool that helps alpaca breeders breed for that product. Do you want your alpacas to make rugs, felt, batts, outerwear OR baby soft blankets and shawl? It’s helpful to know this word micron. What is your goal for breeding alpacas? Now you know, plan accordingly.